The 750 Series Gas Detector is built upon 100 years of gas detection knowledge. With more than 400 hazardous gases and vapors monitored, the 750 Series gas detectors offer a flexible future proof system for gas detection requirements. IGD’s Sentinel+™ 2-Wire protocol permits the 750 series to communicate over the detector power cables. Furthermore, the cables have no specific polarity on connection. 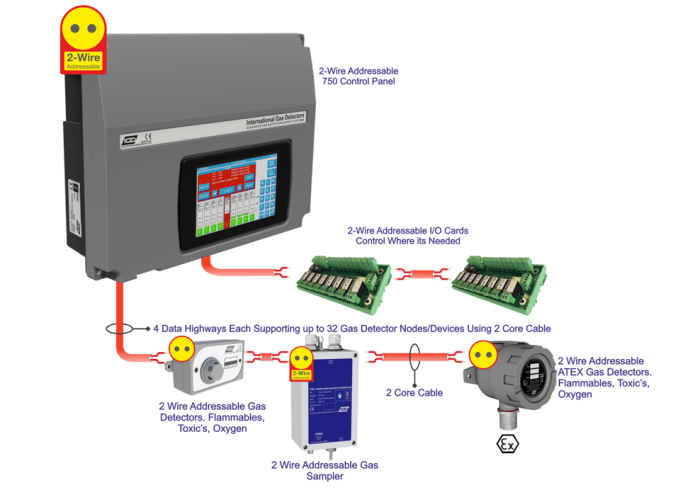 Any mix of safe area gas detectors or any type of ATEX detectors can be networked along with I/O cards, alarms, illuminated signage etc. This decreases cabling speeds installation and minimizes errors. The installed systems have better reliability from the fewer terminations and from IGD’s continuous monitoring integrated into the Sentinel+™ protocol. Data is uninterruptedly monitored, not only for gas readings but also internal diagnostics and calibration, guaranteeing maximum system availability. With only 2 wires for power and communication, existing systems can be easily upgraded using the existing cabling. There is an option to easily incorporate more detectors and accessories where needed. 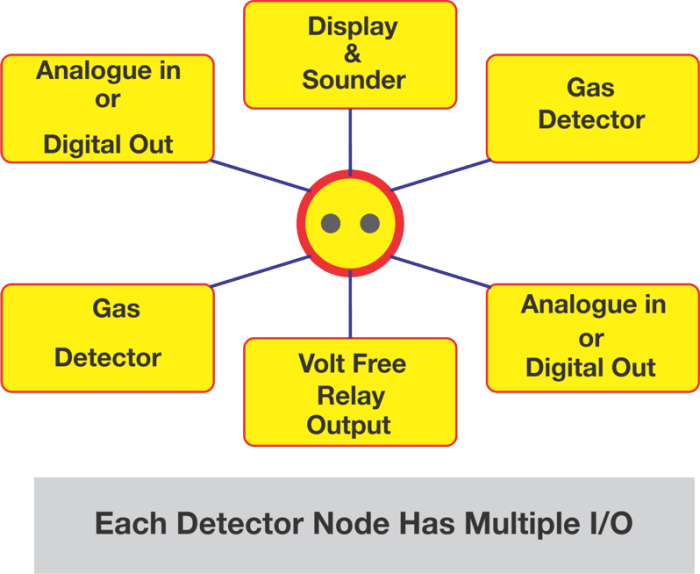 Each 750 Series detector has many I/O options as well as being a gas detector. This makes adding signaling or control functions to the system very easy. Cable a beacon sounder to the closest available detector or integrate control for a solenoid valve. The extra ports on the detectors can be used to read in other analog 4-20 mA signals, pressure, temperature and flow. If it is a 4-20 mA signal then users can read it into the detector and then set alarms against it in the same way as the gas detectors. Two controller versions are available with a full range of interfaces. Mixture of detectors: Any mix of safe area or any type of ATEX detectors can be networked together with I/O cards, alarms, illuminated signage etc.